Talking about the Vietnam War, everyone remind the Ho Chi Minh trail, or legendary road from North to South Vietnam. The original trail was constructed in 1959 and served the war in 6,000 days. In year 2000, the Vietnamese Government reconstructed a new Ho Chi Minh highway connecting from North to the South; However, There are still some original parts of the trail that you can have off-road motorcycle ride or chances to feel the war time. 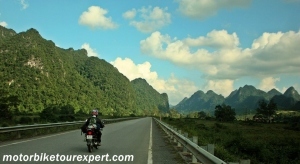 Let Vietnam Motorbike Tour Expert be with you to discover this road and see what the Ho Chi Minh trail looks like today. Starting from Hanoi, we take you to the mountain in North Vietnam via Mai Chau before head down to the South on the trail. This offers wonderful mountain roads, hill tribe people customs and traditions those it’s hard to find along the trail or in Southern part of the country. This is really a big trip passing through many provinces and retracing some parts featured in the Top Gear Vietnam Special show. A real opportunity to experience Vietnam on motorcycle based on the route BBC’s Top Gear Vietnam show was created. Please contact us if you would like to do the tour shorter, longer or simply a little bit different. 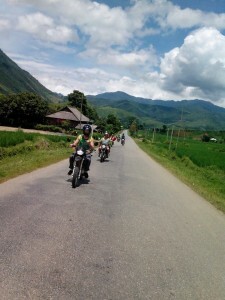 Day 1: Motorcycle ride from Hanoi to Mai Chau: 190 km. 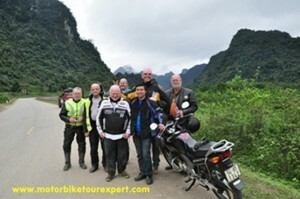 Start the grand motorbike tour through Vietnam by taking a bus to the outskirt of Hanoi, from here we get the bikes and enjoy motorbike ride to Mai Chau. After lunch in An Lac (Hoa Binh province) We will ride through endless limestone karst scenery (known as Halong bay on land), the extensive farming lands comprising a sea of paddy fields split by tree-lined roads. Arrive in Mai Chau in late afternoon. Here we stay overnight with the White Thai minority in a traditional stilt house. The local women here are famous for cooking and dancing so in the evening, after feasting, we can enjoy a cultural show of Thai dancing and a range of special local liquors. After simple breakfast served by local restaurant, We continue the Vietnam motorbike touring on Ho Chi Minh trail to Phong Nha – Ke Bang, the biggest and also the most beautiful cave in Vietnam and Indochina and is now a UNESCO World Natural Heritage site. The karst formation of Phong Nha-Ke Bang National Park has evolved since the Paleozoic (some 400 million years ago) and so is the oldest major karst area in Asia. Subject to massive tectonic changes, the park’s karst landscape is extremely complex with many geographic features of considerable significance. 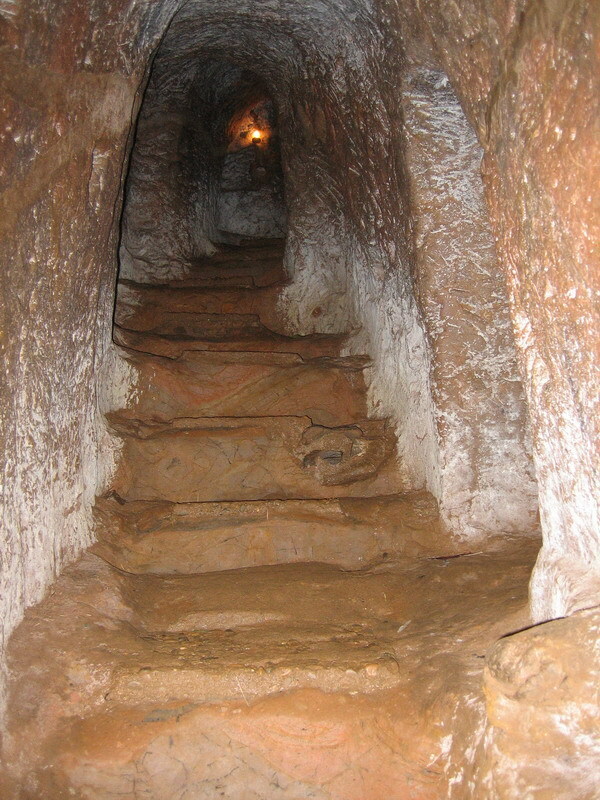 The vast area, extending to the border of the Lao People’s Democratic Republic, contains spectacular formations including 65 km of caves and underground rivers. 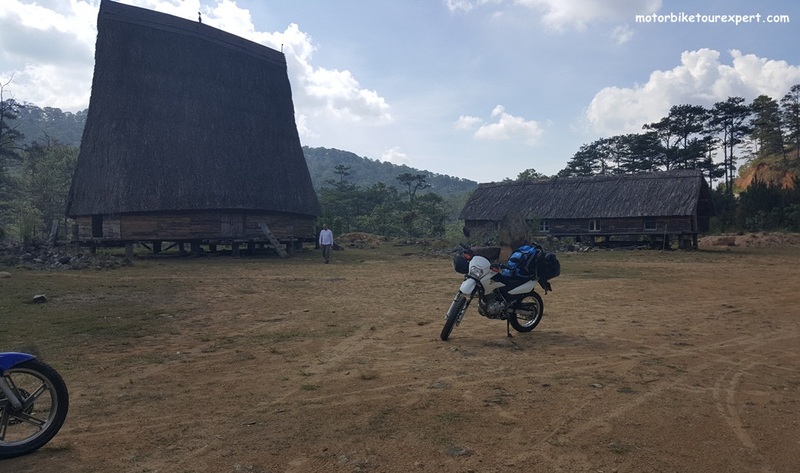 Day 4: Phong Nha – Khe Sanh: 220 Km. From Phong Nha, the Ho Chi Minh Trail is divided into 2 branches one in the eastern side and another one is in the western side. Motorbike Tour Expert recommend to ride on the western Ho Chi Minh trail. 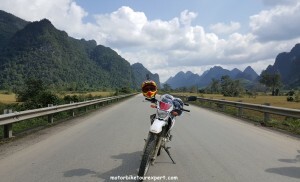 The trail goes through the National park of Phong Nha – Ke Bang, in more than 200 km, you will just see few other motorbikes but a lot of beautiful and beautiful mountain view. Especially, we will get chance to visit the former US Marine Base with tunnels, Air base and a interesting museum that is newly built. This motorcycle ride is another highlight of this 15 day motorcycle tour Ho Chi Minh trail. After lunch we will join the high way No 1 down to beautiful city of Hue. Day 6: Hue – Hoi An: 160Km. 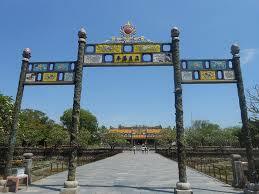 After breakfast, we have chance to discover the famous citadel of Hue and some other attractions. After lunch, we will Join the National Highway 1 and head up the Hai Van Pass (Cloudy Pass) before getting to the World Heritage site of Hoi An, a major trading centre in SE Asia in the 16th and 17th centuries. The ride today is short but it offers amazing view of coastal roads. We spend half day to walk around to enjoy the peace and beauty of the town also visit some attractions to learn more about Vietnamese history and culture. In the afternoon you can take a taxi 4km to Cua Dai beach – the quiet beach with white sand and bright green water or get free time in town for some shopping or massage. Say good bye to the lovely town to get back to the nature. We will rejoin the Ho Chi Minh Trail at Phuoc Son (also known as Kham Duc). From there we head up the towering Lo So Pass, passing through remote areas thinly populated by peoples of the Ba Na ethnicity. Edging close to the border with Laos, where a number of Trail arteries crossed over in Laos, we continue on to Kon Tum. In the morning we head south through the Central Highlands, passing Pleiku and the Ia Drang valley battlefield, before continuing Vietnam motorcycle touring to Buon Ma Thuot (also known as Buon Me Thuot), the city where northern forces launched their final assault on the then Saigon. Buon Ma Thuot produces most and best coffee products in Vietnam so the motorcycle ride today offers a lot of visits to coffee farms and you’ll feel the different beauties from other days. 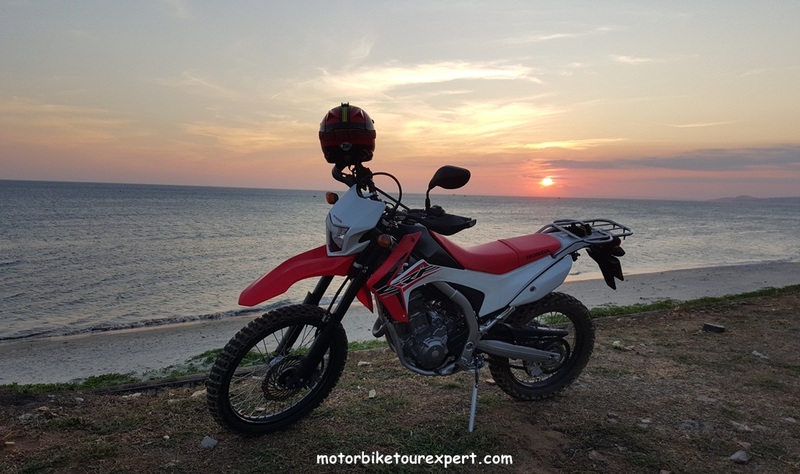 We take an easy drive back down off the Tay Son highlands towards the coast, arriving at Highway 1 some 30 km north of Nha Trang. Taking in this scenic coastal stretch past turquoise waters and scarlet fishing boats, we arrive in the bright lights of Nha Trang and its relaxing holiday options. Full free day at the beach or gathering for a seafood feast to recount our adventure and toast the Ho Chi Minh Trail. Optionally, You can also take a island tour to some beautiful island with some quiet beaches. This motorbike tour from Nha Trang offers you some footages of the famous 2008 BBC’s Top Gear Vietnam Special show. 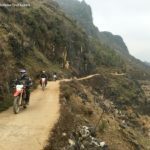 This motorcycle ride is one of the best rides on the mountain area of Central Highland Vietnam, It offer some beautiful ride on the coastlines. It’s another highlight of this Vietnam motorcycle tour. Day 13: Short Motorbike Touring around Da Lat – 50 km. Overnight in Da Lat for the second night. This motorbike ride to Sai Gon is short but could be a big day as traffic is very busy when we enter Saigon ( or Ho Chi Minh City). 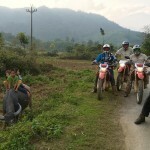 We ride straight to the train station where we end the Grand Ho Chi Minh Trail Motorcycle Tour. 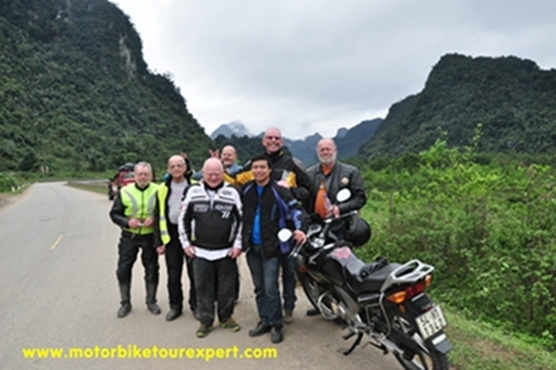 Say good bye to the staffs of Vietnam Motorbike Tour Expert and then take your time to have rest in in the city.